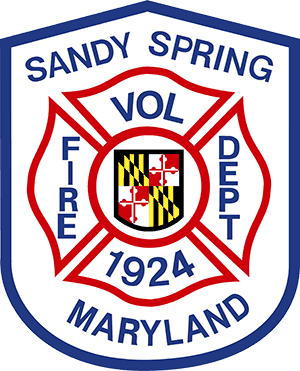 On October 25, 2018, at 10:07 am SSVFD units were dispatched for a house on fire with heavy fire conditions showing at the 200 block of Bryant’s Nursery Road, in Cloverly, Md. Apparently, Montgomery County Police on patrol noticed smoke in area, investigated, located the ‘well-involved’ house, and notified Montgomery County Fire and Rescue Services (MCFRS). First due on the call to Box 2413 were Paramedic Engine 724 from Hillendale’s Colesville station, Paramedic Engine 704 from Sandy Spring, Paramedic Engine 718 Kensington’s Glenmont station, Paramedic Engine 740 from Sandy Spring’s Olney station, Paramedic Engine 725 from Kensington’s Aspen Hill station, Kensington’s Paramedic Engine 721, Aerial Tower 724 from Hillendale’s Colesville station,Truck 715 from Burtonsville, Rescue Squad 715 from Burtonsville, Tanker 704 from Sandy Spring, Ambulance 724 from Hillendale’s Colesville station, Battalion Chief 701, Battalion Chief’s 701 and 704, Tanker 717 from Laytonsville, Tanker 731, Tanker 730, Paramedic Engine 712 from Hillendale, Aerial Tower 718 from Kensington’s Glenmont station, Rescue Squad 703 from Rockville, Advance Life Support 725, A712, among other units including Canteen 740 from Sandy Spring’s Olney station. BC704 was the first Chief on scene. The fire was described as a large, 2-story, single family home with heavy fire upon arrival, a partial roof collapse, and occupants initially not accounted for. Soon thereafter occupants were accounted for (not home at the time). Firefighters had to contend with a long (~1,200 ft. driveway) in a non-hydranted area. A Water Supply Task Force (WSTF) was called for and tanker operations were established. The WSTF consisted on W717, W731, W730, PE712. Mutual aid assistance was received frorn Howard County Tankers 3,11,and 13. Also on scene were Ops Chief 700, Duty Chief 700, Safety 700, EMS 704. The Rapid Intervention Dispatch (RID) consisted of AT718, RS703, ALS725, A712. At one point more than 75 firefighters were on the scene. Smoke could be seen for miles and soon, the NBC News helicopter was overhead providing aerial video showing the house fully engulfed. As of the time the fire was knocked down, the cause of the fire was undetermined but the damage was estimated at greater than $750K, a total loss. While there were no occupant injuries (as the occupants were not at home at the time of the fire) several pet birds were unfortunately unaccounted for. By 6 pm, command decided to keep an engine crew on site throughout the night, on 2-hour rotations, due to a few hot spots, accessibility issues, and the remote location of the structure.